It was like a mini-vacation, diving above a city of clouds. Upon submersion, I felt the cool relief of Howe Sound washing away the heat of an unusually warm autumn sun. Megan, Glen and I ducked below the surface, guided by the mooring line through a thick green layer of single-celled algae, a bloom inspired by two weeks of clear, warm weather. Visibility abruptly improved at 40 feet and, though dark, it was clear and spectacular. Below, four divers swam, their bubbles rising like champagne. Dive torches illuminated a vista of rock pinnacle, cloud-shaped sponges, and large schools of perch, rockfish and greenling. We had arrived at the Halkett Pinnacle, home to one of Howe Sounds’ famous glass sponge reefs. The others were leaders in the dive community; dive instructors from the UBC Aqua Society, Ocean Quest, and the Diving Locker. The previous week the group included Dive Masters and Instructors from Sea Dragon Charters. These organizations and businesses were invited to share in the wonder of these delicate underwater habitats – and to share in the responsibility of protecting them from diving activities. 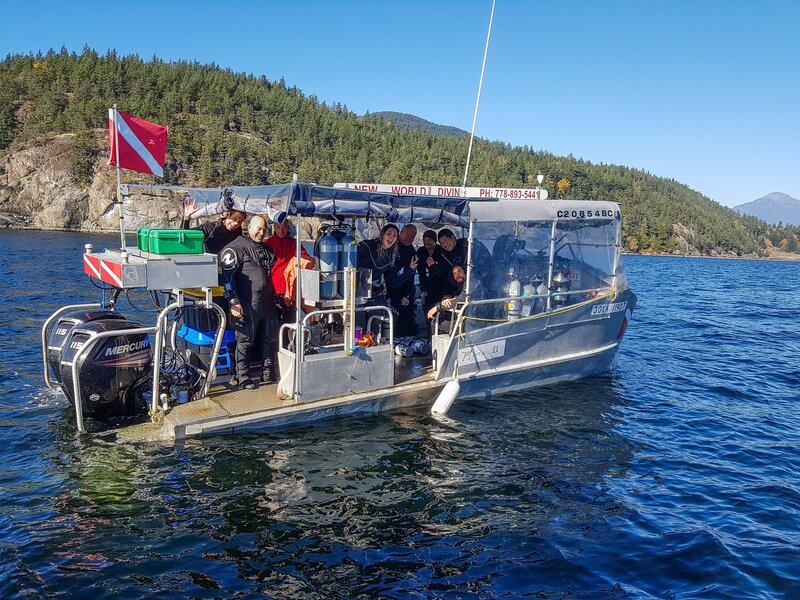 The Underwater Council of British Columbia (UCBC) and Marine Life Sanctuaries Society (MLSS) provided the funds for this outreach program to ensure the dive community does not “love the reef to death”. My dive buddies and I swam north along the pinnacle to a saddle leading to a large intact sponge bioherm. The bioherm was a special destination for us – it was akin to visiting an underwater museum with artefacts that were thousands of years old. A sponge bioherm is a reef growing entirely on the skeletons of older, now deceased sponge reef. The bioherm sponge is extremely old – the original sponge did grow on rock – rock that was scoured by the last glacial retreat. Conditions suitable for the original sponge occurred approximately 6000 years ago; since then a continuous deposit of silt has formed a meters-thick layer above the glacial-scoured rock. As the silt built up so did the sponge, with dead sponge propping up the living, allowing it to reach currents that sweep the seabed of Howe Sound. 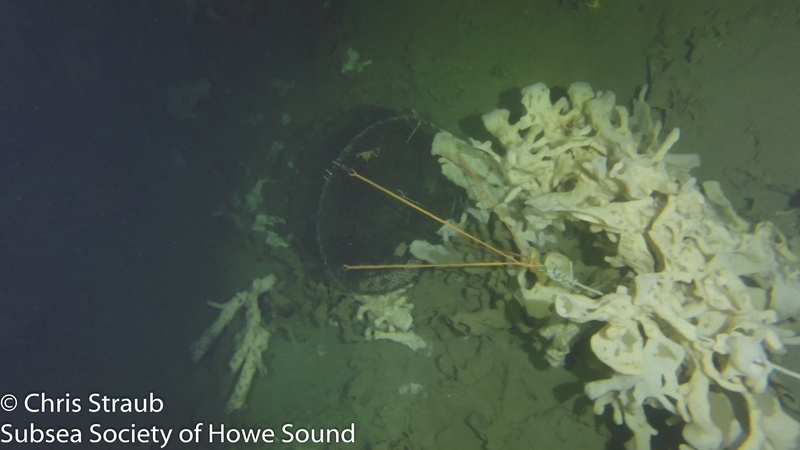 Prawn traps such as this illegal one recently discovered in 180ft in the Halkett Bay Provincial Marine Park can permanently damage sponge reefs. Photo courtesy of Chris Straub. The saddle was a literal boneyard of sponge – fragments of the paddles and chimneys that make up the convoluted bodies ofglass sponge littered a swath of seabed the size of a baseball diamond – all broken from some unknown physical contact. It may have been fishing line, which acts like a hot knife through butter when it cuts into a sponge. Or anchor damage; the delicate sponge skeleton is no match for lead cannonball weights. Prawn traps are a common issue for sponge reefs – one trap can decimate a 5m2 area with a single deployment. Some damage may have resulted from inexperienced divers bumping and finning into the sponge, or from the silt kicked up by divers swimming too close to the bottom. While fishing, boating and divers are all likely factors contributing to the Halkett “boneyard” it is the latter, the impacts from inexperienced divers – which has inspired our dive today. The organizer for today’s dive was Adam Taylor, a local diver, photographer and naturalist. As President of the UCBC and Director for MLSS, he helped facilitate two years of discussions between local non-profits and BC Parks that lead to the 136-hectare expansion of Halkett Marine Provincial Park in 2017 to include the pinnacle and surrounding sponge bioherm. Preventing damage from commercial fishing activities is on the horizon after Glen Dennison shared his information on sponge reef locations with DFO. By diving together, we can also address impacts to the reef from inexperienced divers. UCBC and the MLSS have received sufficient anecdotal evidence from the dive community to suggest diver-damage on this and other reefs accessible to scuba is a reality. This information has not been lost on government regulators either; Halkett Marine Park managers are considering restricting diver access in an updated management plan for the park. Further, as DFO considers closures to fishing activities on Howe Sound sponge reefs, they must also address the potential of diver-related damage. In response, UCBC and MLSS are working with the local dive community and government regulators for a solution. The proposed solution does not prevent diver access, but contrarily, it improves access, and at the same time, ensures only divers skilled in buoyancy and situational awareness dive the reef. 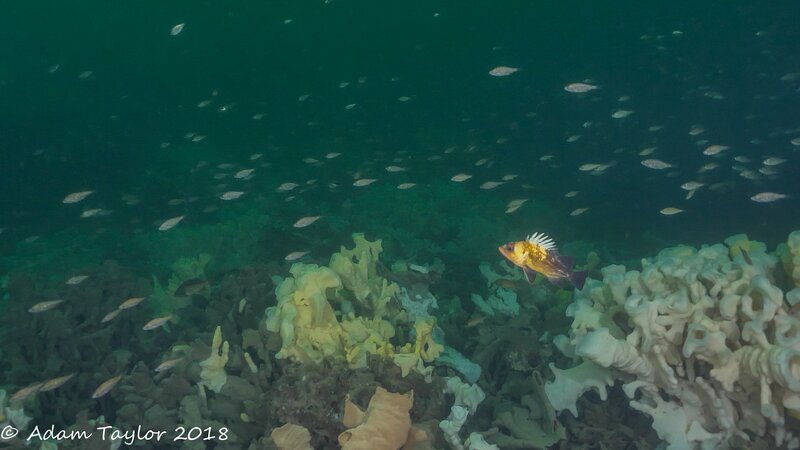 Throughout the dive I wondered at the life in the reef: Quillback rockfish hovering over the sponge picked off small perch from the school above with short bursts of energy. Squat lobsters the size of my pinky finger retreated from my light beam into the oscula and folds of the sponges. Dots of turquoise gave away the egg masses carried by tiny translucent shrimp that coated the sponges’ surface. Occasionally the camouflaged body of a lingcod would take shape, giving my heart a jump at the surprise. I also checked on the dead and dying sponge. I was curious to understand how the sponge died and to find evidence of recovery. A large bundle of sponge chimneys lay still living but broken at the base and laying horizontal on the seabed – certain death by siltation in its future. One mass of dead sponge the size of a large yoga ball appeared to have died intact with no evident cause. Some standing dead sponge had a thick coating of silt, clogging its pores and preventing life-giving oxygen exchange. Some artefacts of glass sponge had been encrusted by another, rusty-coloured sponge that gave it a glossy appearance and hinted at the possibility of death by smothering. As we approached the pinnacle again, Glen caught my attention. The flashing of his torch and his smile – hidden except for the crinkle of his eyes – gave away his excitement. 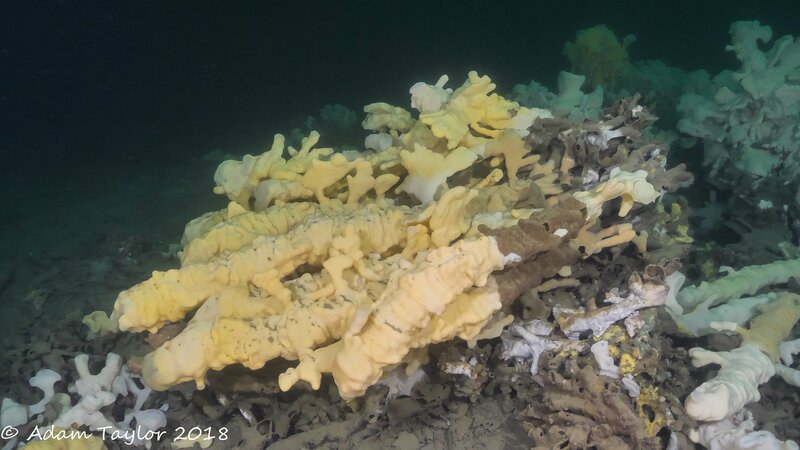 Growing on a clump of dead sponge and the surrounding rock we could see thick vermiculations of cream-coloured streaks– new growth of glass sponge! Diving here last year I noticed a thin film of this growth; now it was about 2cm thicker with small volcanic projections. This was very exciting indeed! It showed glass sponge recovery in action – albeit at a very slow pace. I shot Glen a big fat “OK” sign to show my appreciation as I searched for more evidence of new sponge growth. 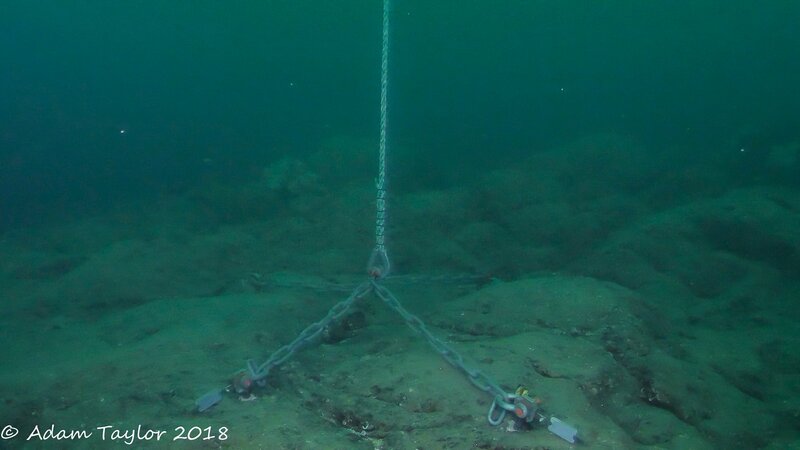 Shortly after this discovery, we encountered the new anchoring system installed this summer by UCBC thanks to a large contribution by the Coquitlam Dive Club. Adam Taylor’s brainchild, the Halkett anchoring system will prevent people from dropping “down-lines” used to guide divers to the pinnacle. This is important as the down-lines are weighted with cannonball weights, which, if they miss an open area of pinnacle, may land on and damage sponge. Some charter operators understand this and take the extra care to have Divemasters hand-place the cannonballs in the open areas. Even so, there have been situations where divers will hang onto these down lines rather than use them as a visual reference. Strong surface currents may then act on the diver causing the cannonball below to drag off the pinnacle and into the sponge reef. 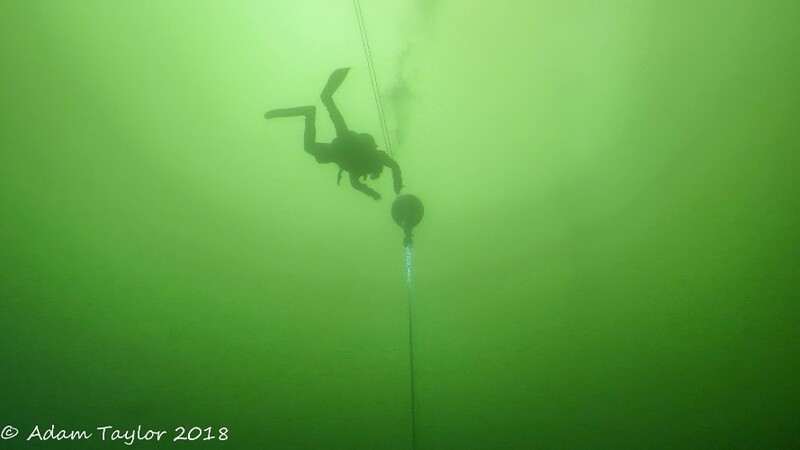 This was my first time diving with the new anchor system. It consists of 4 bolts drilled and epoxied into bedrock each with a chain leading to a shackle. For today’s dive, Chris and Rahim installed a temporary mooring line for the dive boats. They dove the pinnacle ahead of the others, threading the line through a shackle on the float before returning it to the surface. The anchor will one day be fitted with a permanent approved mooring system at the surface for dive boats to secure to. After my inspection of the new anchoring system, I noticed Glen and Megan waiting patiently above to begin the ascent. Slowly we rose, following a decompression schedule before returning to the surface. Having a mooring line is particularly beneficial for this, as it provides a point of reference at critical depths where we must stop to safely off-gas excess nitrogen from our tissues. Obviously, diving the Halkett Pinnacle presents safety challenges to divers as well. It is a deep dive with strong currents and often poor visibility. Too often, motor boat operators don’t understand or ignore the dive flag requiring them to slow down and stay well clear of the diving vessel and will come too close for the comfort of divers below. These reasons, along with the environmental concerns over glass sponge breakage, make this a site for skilled and experienced divers only. An important take-away for these outreach dives was the recognition by all involved of the safety and environmental concerns when diving on sponge reefs. This segued nicely into the next phase, which involves a PADI-approved skill development course in diving sponge reefs. The PADI Bioherm Sponge Diver course was developed by Greg McCracken of Ocean Quest Dive Centre and is currently offered by Ocean Quest, UBC Aqua Society, and Dive and Sea Sports with other dive shops in-line to offer it in the future. Another, shorter course for divers with Tech40 or equivalent certification is also available. Both are integral to educating divers and testing their skills to safely dive sponge reefs without damaging them. To ensure diving continues to be allowed on the reef, we propose the course be mandatory for all divers who visit the reef. This involves the cooperation of the many dive businesses and organizations who train new divers and take them out on dive trips to sponge diving locations such as the Halkett Pinnacle. After breaking the surface with smiles and “I’m OK” salutes to topside crews, we clambered aboard Glen’s boat the Skyliner, joining Chris, Rahim, and the divers aboard the charter vessel Mina II of New World Divers, part of our diving “flotilla”. While the dive lasted less than one hour, my mind felt as if I had just enjoyed a weekend relaxing amidst beautiful, wild scenery. Post-dive, we met at Horseshoe Bay to share in appies, a pint and stories of the dive and plans for keeping the reef intact for future dives. It is amazing what can be accomplished when like minds blow bubbles together!